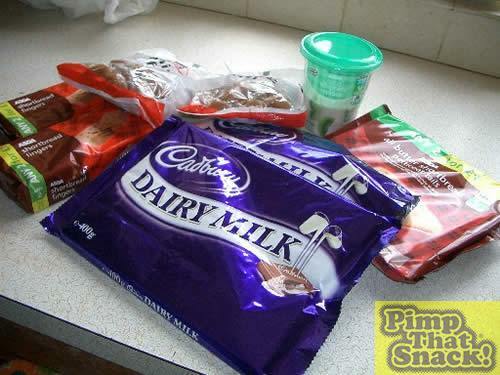 Snack Pimping! A shadowy flight into the dangerous world of snack that does not exist. Adam and Frances - 2 young(ish) loners on a crusade to champion the cause of the hungry, the starving, the snackers, to create a snack that is above the law. 2 bags of soft/chewy toffees. Heat the whipping cream in a saucepan, stirring constantly so to not let it boil or create a film on the surface. 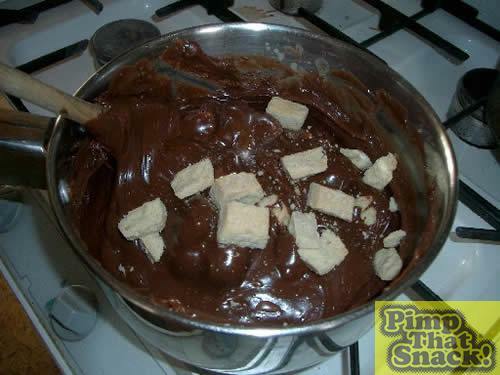 Break a bar and a half of the chocolate into chunks and throw in another saucepan. 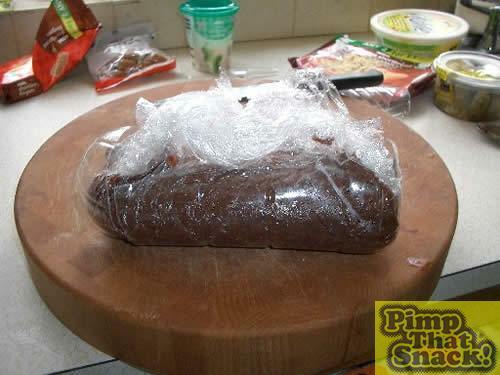 Pour the cream over the chocolate so that it melts and then stir continuously to prevent from sticking to the pan. If there's two of you then while you are stirring the other one can be breaking up the shortbread into chunks about the size of a sugar cube. If you are attempting this alone then you might wanna do this 1st. Add the shortbread to the mix and carry on stirring till it's the shortbread has been fully covered and accepted into the community. 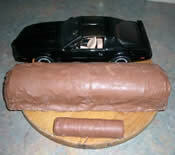 Once it is ready you are going to want to mould it into a long tube. To do this, we cut a bottle in half vertically, poured the mix onto some cling film and rolled it up and placed in the bottle to be put in the fridge/freezer to set. 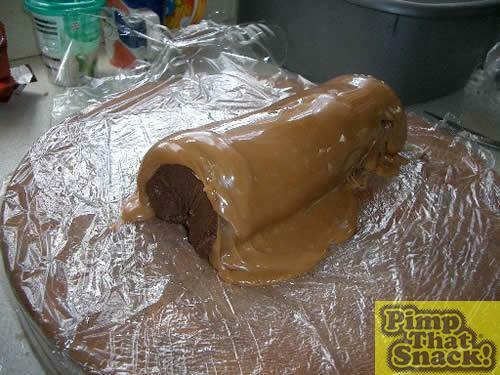 To pass the time engage in a race to unwrap all the toffees. 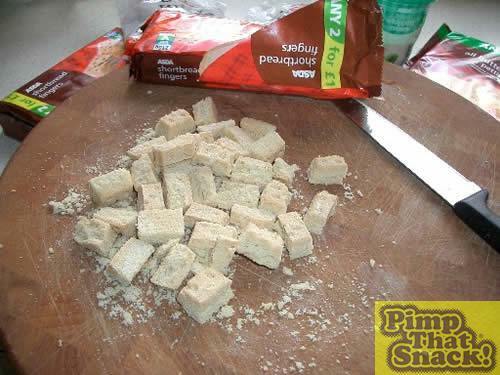 Oh, yes, Not only are you getting snack pimping but a fun activity for all the family. Warning - Don't play against women who love their sweets. They have devised an unbelievably quick way of unwrapping them. 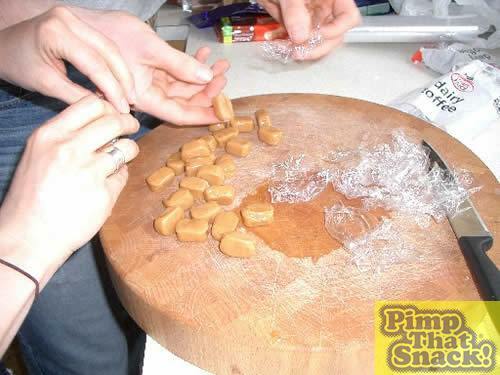 If you have no other choice then standing in front of the bowl so they cannot put their toffees in is NOT cheating. Once they are unwrapped nuke the little blighters just short of radioactiveness.